When it comes to sides, our fall back is rice. We love rice and thankfully, many cultures embrace rice in their cuisine. 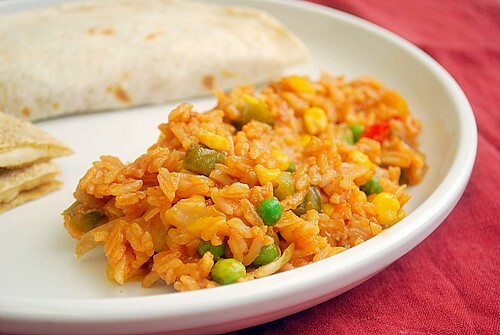 To accompany the Chicken Fajitas I made recently, I looked for a Mexican Rice recipe to try. This rice came out fluffy and really complimented our fajitas well. I especially liked how quick it was to put together. I added some vegetables to the original recipe for color and to make it heartier. So this is a side dish that everyone in the family can enjoy! The key to making Mexican rice is toasting the rice before it cooks with liquid. Doing so tends to bring out a depth of flavor and allows the rice to bloom as it cooks. For this recipe, I sautéed onions, garlic and bell peppers until softened before introducing the rice. Having the vegetables in first ensures that they are completely tender once it's all done. Once the rice is added, it's important to toast it as long as possible without browning or burning. You'll notice a nice nutty aroma as it toasts. At that point, the liquid is added and for this recipe, tomato sauce and chicken broth is used. Cook the rice as noted and once it's done, fold in the frozen corn and peas. The residual heat of the dish will automatically heat them up and it's ready to eat once warmed through! Add the chicken broth; bring to a boil. Reduce heat to low, cover and simmer for 20 to 25 minutes. Uncover and add frozen corn and peas. Fold in and cover for 3 minutes until warmed through. Fluff with a fork before serving. I liked this recipe although rice is different from Indonesian Rice. Thanks for share your recipe. I've been on the hunt for a new rice recipe, and I think this will fit the bill. Seems really easy. Thanks, Joelen! This recipe sounds really well thought out. Will try this with the fajitas recipe I enjoy making. My ex's mother (90-year old, Mexican-born) taught me how to make Mexican rice last year, and she too, toasts the rice. However, she toasts the rice until they are all brown and then adds the other ingredients. It comes out perfectly. I love how creamy your rice looks; it is a great variation. She rinses the rice to remove the creamy texture. Just came across your site as I was looking for a new rice recipe. Love your posts - I just started compiling my own recipes in a blog and it's great to have your site as a resource. I'm also a former Chicagoan so I appreciate that angle as well. Thanks for your ideas! Can this be frozen. I'm making up a bunch of freezer meals for my son and his wife who are expecting their 2nd baby in 2 weeks. I have another recipe where you roast some chicken pieces then make a rice with cr. of chicken soup and tuck the chicken into the rice and finish baking. Once cooked, can that be thawed and reheated?? I want complete meals with mom doing as little as possible. Thanks for your great ideas.